The CardExchange® Producer SBS Client Licence is used in addition to a Master licence to enable additional users on the network to access and use a centralised version of CardExchange®. A Master Licence for either Professional or Ultimate Edition is required first and Client Licences can then be added to allow multiple users. There are no limits on how many Client Licences can be added. Keep your data and card designs in a central location that can be accessed by multiple users. CardExchange® SBS is ideal for multi-site organisations and businesses such as universities, hospitals and large corporations. Through customised permissions for each user, you can ensure they have access to the card designs and data that they need for their function. Furthermore, centralised data ensures that everyone is working to the correct and current version. With all the features of the single license version, CardExchange® Producer SBS comes in 4 versions that can be purchased individually to create the perfect solution for you. Start with either the Professional or Ultimate Editions and add on the Print Server and Dispatcher modules as required. 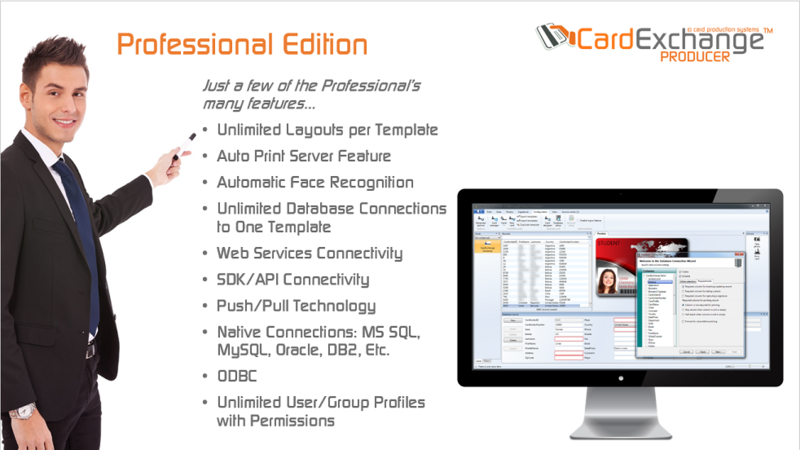 If you want to connect to any type of database, CardExchange® Producer SBS Professional Edition is the way to go! access to all the available functions of CardExchange™ - no limitations! 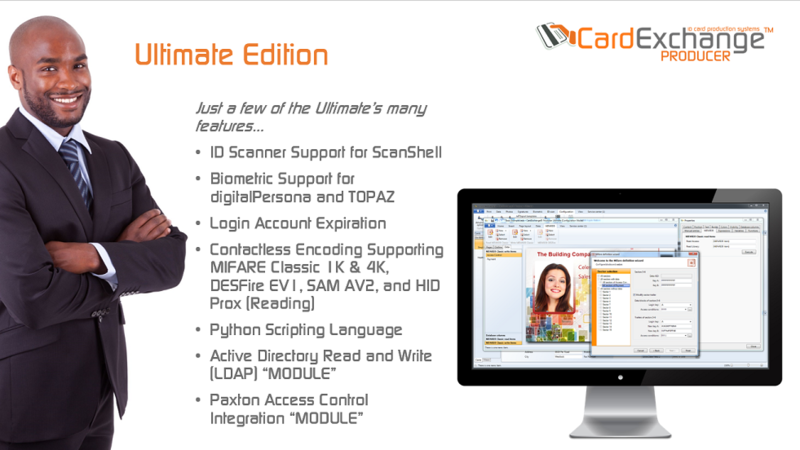 When it comes to inline contactless encoding, the CardExchange® Producer SBS Ultimate Edition sets the standard! CardExchange® SBS Premium 6.x to 9.x Upgrade Manufacturer Part Number: MSU583 If you are alre..
CardExchange® Producer SBS Master Licence The CardExchange® Producer SBS Master Licence can r..
CardExchange Producer SBS Client Licence The CardExchange® Producer SBS Client Licence is..
CardExchange® SBS LDAP Connector for AD Manufacturer Part Number: SBM100 When using CardExchange® ..
CardExchange® SBS Paxton Access Net2 Connector - Version 10 When using CardExchange® Producer SBS, ..
CardExchange® Producer SBS Print Server Module Use the CardExchange® Producer Print Server to enabl..
CardExchange® Producer SBS Dispatcher Module CardExchange® Producer Print Dispatcher Edition offers..